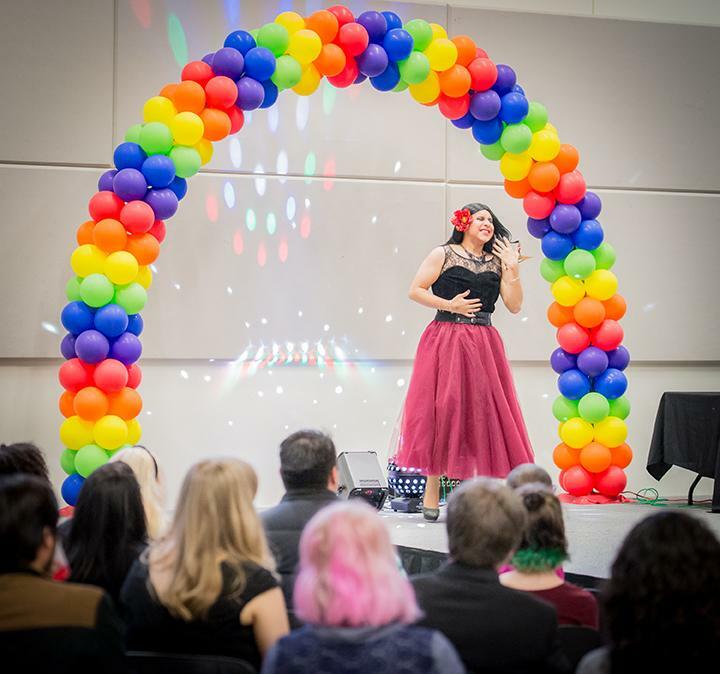 SCC’s Project Pride welcomed everyone to this year’s Pride Prom (previously Queer Prom) on May 12, 2017. Held in the PUB Main Dining Room, the dance was open to the public and without an entry fee. The dining hall was decked out in pride flags, rainbows, multi-colored tablecloths and candles, a brightly colored disco-ball, and a rainbow arch of balloons that remained in the PUB for days after the dance. Tables with banquet food and drinks crowded the sides of the dance floor along with a colorful cake, almost too pretty to cut, in the back. Attendees flocked to the photographer in the corner, decked out in both colorful and classic prom dresses and suits. 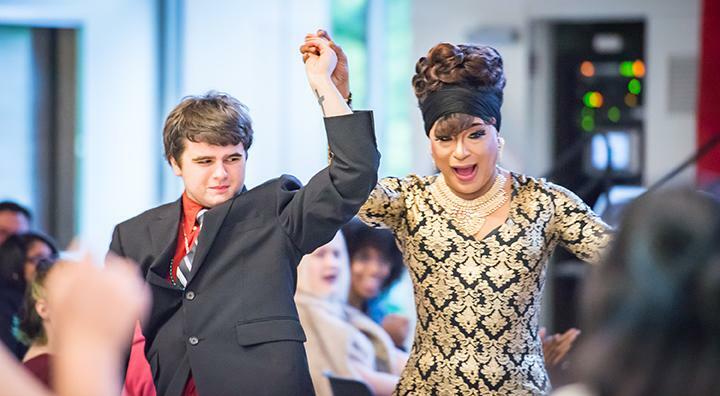 The prom kicked off the night with a slew of drag performances by queens from Miss Premier International. Risque, glitzy, over the top- from glam cabaret style dance to Empire Cast’s “Look But Don’t Touch”, or classically flirtatious and dramatic struts to Whitney Houston’s “I Want to Dance With Somebody”, they made sure to show prom-goers how to dance. Seattle-based DJ Reverend Dollars played tracks throughout the night, bringing her distinct flair and musical life to the Prom. Founder of Darqness, a “Queer and Trans People of Colour Arts Collective” (a mouthful, but amazing!) she brought the perfect blend of pride and rhythm.